Editor’s note: This column is part of our Best Stocks for 2019 contest. Charles Sizemore’s pick for the contest is LyondellBasell (NYSE:LYB). As we near the end of the first quarter, the competition is fierce in InvestorPlace’s Best Stocks for 2019 contest. Cannabis product maker Charlotte’s Web Holdings (OTCMKTS:CWBHF) is leading the pack, up 67% at time of writing, but onshore oil and gas producer Viper Energy Partners (NASDAQ:VNOM) isn’t far behind at 29%. Against this competition, LyondellBasell Industries (NYSE:LYB) and its modest 4% would seem to be getting left in the dust. But it’s still early, and we still have a lot of 2019 left to go. And I’m expecting LyondellBasell to make it a competitive race, come what may in the market. A cheap price is no guarantee of investment success, at least over short time horizons. But it certainly creates the conditions to make outsized gains possible. LyondellBasell trades for 7.2 times trailing earnings and just 0.83 times sales. 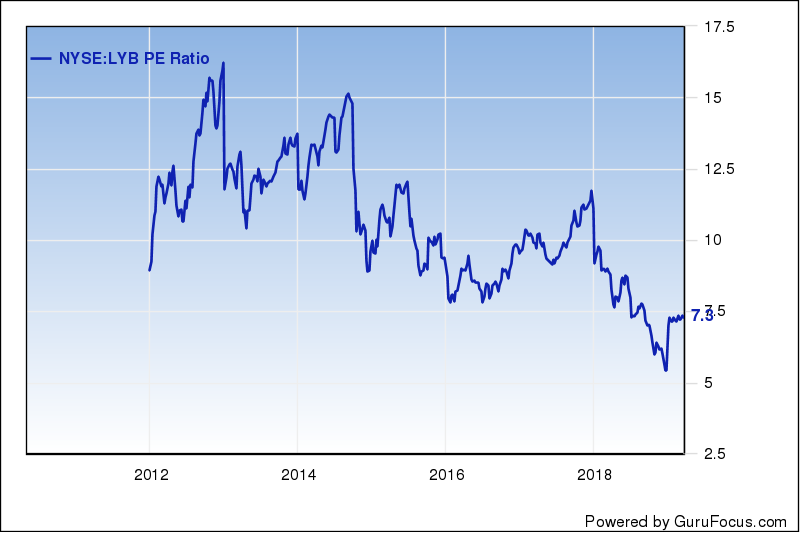 To put this in perspective, LyondellBasell’s P/E ratio was over 16 in late 2012; by this metric LYB stock is trading at less than half its valuation of seven years ago despite price/earnings multiples expanding prodigiously across most of the stock market over that same period. Likewise, LYB’s price/sales ratio has been bouncing around in a range of 1 to 1.4 since 2013. Today’s 0.9 takes the stock’s valuation back to early 2013 levels. The dividend yield is an imperfect measure of value because a company’s payment preferences can shift over time. But it’s worth noting that, at 4.6%, LyondellBasell’s dividend yield is close to the highest levels of the company’s history. Again, a cheap stock price doesn’t guarantee a hefty stock return, at least not over any specific time horizon. But it certainly creates the conditions that make outsized returns possible. Value Stocks Set to Assume Leadership? Historically, growth and value have alternated leadership, with each having extended period of outperformance. 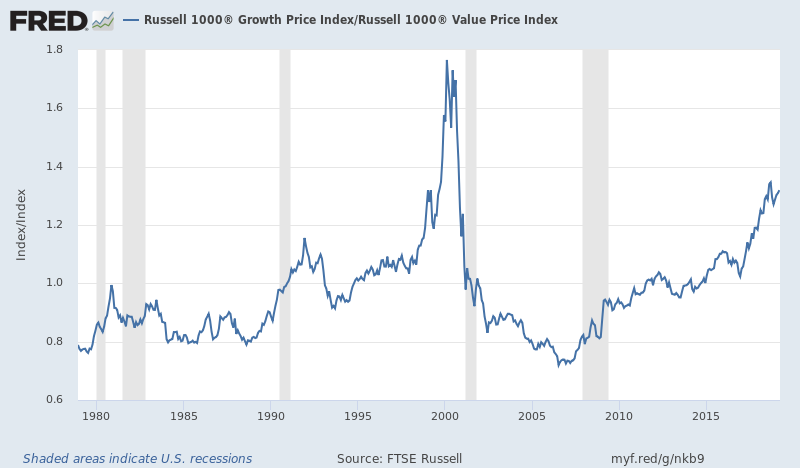 Consider the chart above, which compares the Russell 100 Growth to the Russell 1000 Value. When the line is moving higher, growth stocks are outperforming value stocks, and when the line is moving lower, value stocks are outperforming growth stocks. For most of the 1980s, value stocks modestly outperformed. But from the late 1980s through the blow-off top of the internet bubble, growth absolutely dominated value. Of course, this reversed between 2000 and 2008. Over this period, value stocks beat the pants off growth stocks. Following the 2008 meltdown, growth stocks took the lead again, where they’ve been ever since. Now, there are absolutely no guarantees here. While I believe that value stocks are “due” for an extended period of outperformance, I could have made the same argument at any time over the past several years, and I’d still be waiting for the reversal. All the same, value investing has proven to be a winner over the long haul. Dimensional Fund Research did a study of the 90 years between 1926 and 2016 and found that large-cap value stocks returned 12.5% per year compared to 10.3% for the S&P 500. We’re not likely to hold LyondellBasell for 90 years and, in any event, future returns may or may not look like the past. But if value stocks are poised to outperform, LyondellBasell looks all the more attractive. I’m a big believer in dividends. They allow you to realize a respectable return without having to sell your shares. Furthermore, you really have no control over what Mr. Market is going to do. Stocks, for sometimes for years at a time, and often without a specific reason. It’s easier to sit through rough patches like that when you’re getting paid in cold, hard cash. As I mentioned, LYB stock yields a healthy 4.6% in dividends. That’s better than what most REITs and utilities yield these days. But what I like even more than the raw yield is LyondellBasell’s recent history of raising the dividend. Last year, LYB hiked its dividend by 11%. This followed a 6% rise the year before and a 9% rise the year before that. Since initiating its dividend in 2011, LyondellBasell has increased its dividend by a factor of 10. I don’t expect that kind of growth going forward. But I do expect LYB stock to continue to raise its dividend by 5% to 10% per year. The company’s dividend payout ratio is a very modest 33%, meaning there is plenty of room for growth. LYB also took advantage of its depressed stock price to opportunistically buy back 19.2 million shares last year. While I generally prefer dividends to buybacks, repurchasing shares at depressed strategies is a solid shareholder-friendly move. And so long as the stock is trading near today’s rock-bottom prices, I support continued repurchases in lieu of aggressive dividend hikes. Will any of this be enough to get LyondellBasell over the top in the Best Stocks for 2019 contest? Only time will tell. But I can say this: I would feel a lot more comfortable with LYB shares in my retirement account than any of the other contenders this year. As of this writing, Charles Sizemore was long LYB. Article printed from InvestorPlace Media, https://investorplace.com/2019/03/best-stocks-for-2019-lyondellbasell-is-set-for-a-strong-second-quarter/.